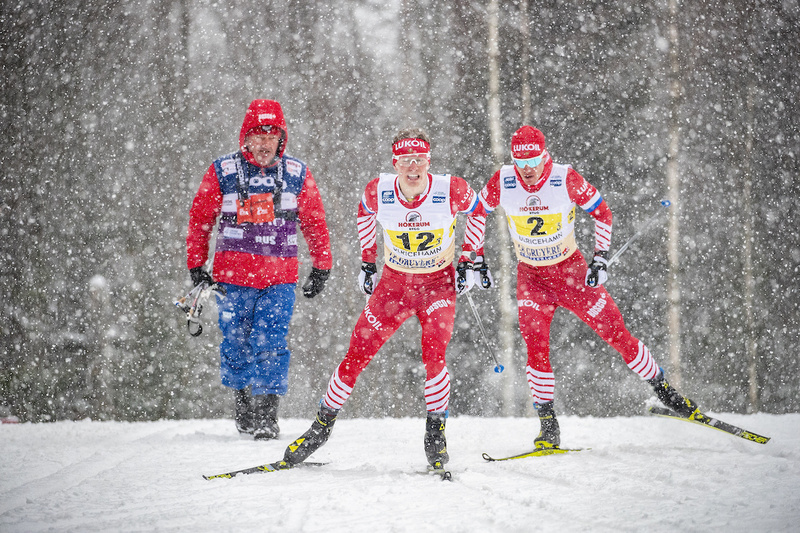 Today in Ulricehamn, Sweden, the men skied a 4 x 7.5- kilometer relay in unsettled conditions. Racers dealt with harsh conditions as the wind howled and heavy snow fell. With a softened course, it appeared most teams struggled with kick on the steeper climbs. Russia II took the victory today in a time of 1:17:53.2 minutes with Evgeniy Belov, Alexander Bessmertnykh, Denis Spitsov and Artem Maltsev. 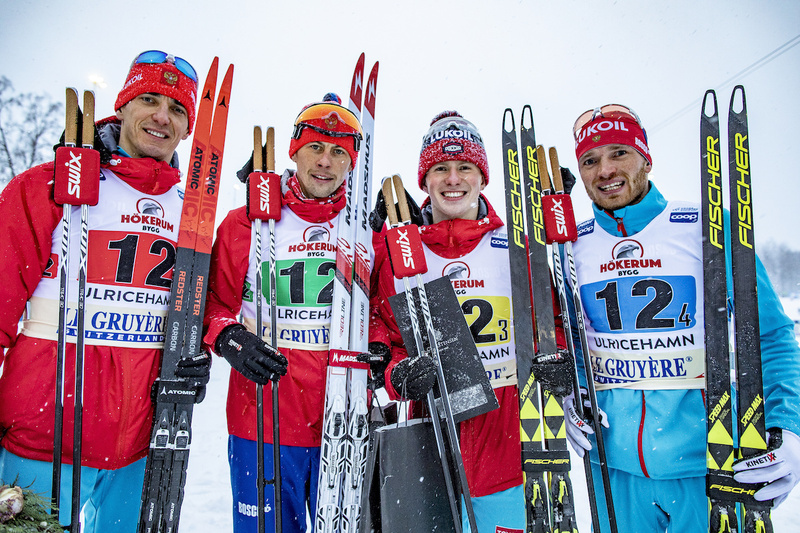 The winning team was followed closely by their teammates on Russia I; Andrey Larkov, Alexander Bolshunov, Andrey Melnichenko and Sergey Ustiugov. Atypically, Norway had a rough start to the day – more on this in a bit — but the entire team put in a massive effort to claim third place. 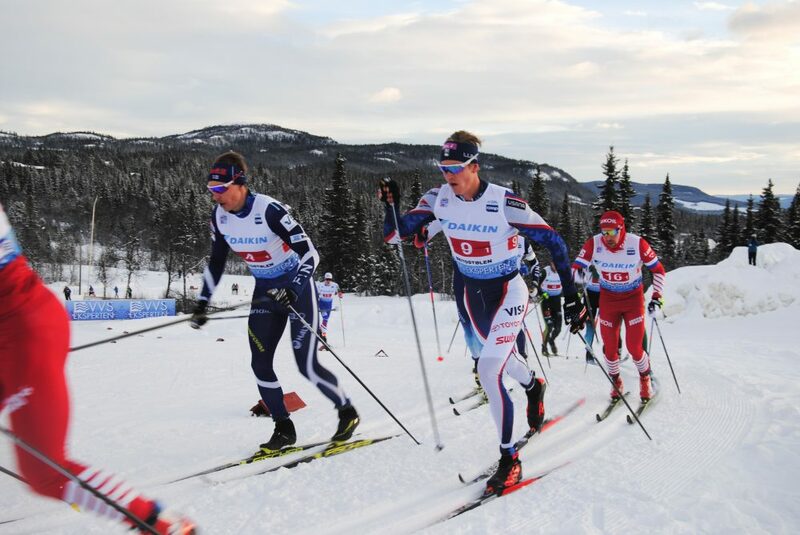 The Norwegian team consisted of Hans Christer Holund, Didrik Tønseth, Sjur Røthe and Simen Hegstad Krueger. The Russian teams lead the entire race, flip-flopping between leaders. Russia I and II worked together throughout, but Russia II had superior fitness. With each Russia II surge, Russia I was unable to match the pace. In the closing k’s, Russia II charged for the finish. Russia I couldn’t hold on. Russia I finished 20.8 seconds behind. During the initial lap of the scramble leg, the entire field remained close-knit. Only at the start of the second lap did both Russian teams, along with Sweden I, begin to gap the field. The Russians were able to hold this lead throughout the race. As the race progressed, and the pacing screws turned, Sweden was unable to match the Russians as they faded to place fifth overall (+1:39.6). USST Head Coach Chris Grover commented on the Russian team’s performance this season. The Norwegian team, as strong as they were, fell back during the first classic leg. It was a gradual decline for Holund throughout his 7.5 k effort. Coming into the first exchange, Norway was sitting in 12th place. During Norway’s second leg, Tønseth made gains. He tagged Norway off in fourth place, giving his teammates a chance at the podium. Røthe, the third skier for Norway hammered to put his team within eyesight of third, which at the time was held by Lari Lehtonen of Finland. By the end of his leg, Roethe had caught, passed and dropped Lehtonen, putting Norway solidly in third place. Krueger, the Norwegian team’s anchor, was able to hold third place until the finish. According to FIS, Norway has been on the podium in every men’s distance relay for the last 12 years. The U.S. relay team, Erik Bjornsen, Scott Patterson, David Norris, and Benjamin Lustgarten finished 13th overall (+4.10.8). During the first two legs, the U.S. team sat in the top-10. Bjornsen skied a strategically strong race, skiing smoothly towards the front of the pack. For the remainder of the race, the U.S. bounced bouncing between eighth and 13th place. Bjornsen chose to race only the relay this weekend in preparation for World Championships which begin in three weeks. His conservative approach to race stars this weekend left him feeling fresh for Sunday’s relay. “Erik did a great job, stayed in the fight for a long time there and it may be one of Scott’s better classic races. He did a really good job of holding steady with the group that he was in,” Grover commented. This was Norris’s first World Cup since the U.S. National Championships concluded in early January. The U.S. team has a distance and sprint training camp planned for the next two weeks until the World Cup in Lahti, Finland on Feb. 9. The Lahti races include a skate sprint and team sprint, with no distance races scheduled until Cogne’s races starting on Feb.16. These training camps are in preparation for the World Championships in Seefeld, Austria.